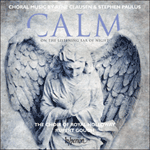 Pater noster was commissioned by Rupert Gough and The Choir of Royal Holloway for this recording and was first performed at the London Festival of Contemporary Church Music in 2014. Clausen wished to show reverence for the ancient text in its Latin form, trying ‘not to “overdress” the text, but to respect it’. Within this contemplative atmosphere there are elements of word-painting, from the obvious high scoring of ‘in caelo’ offset against a low-voice ‘in terra’, to the harmonic subtleties of ‘tentationem’ or delicate nuance of ‘libera nos’. sicut et nos dimittimus debitoribus nostra. Et ne nos inducas in tentationem: sed libera nos a malo.